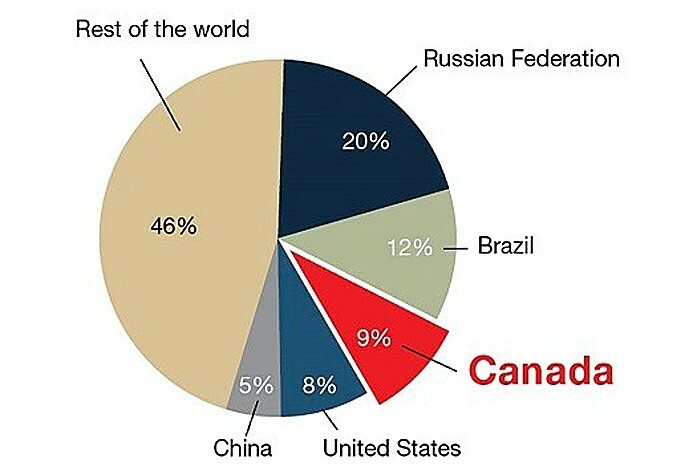 Canada has nearly 9% of the world’s forests, with the Russian Federation hosting the most at 20%, followed by Brazil (12%), the United States (8%) and China (5%). But what makes a forest a forest? According to the Food and Agriculture Organization of the United Nations (FAO), a forest is defined as land spanning more than 0.5 hectares where the tree canopy covers more than 10% of the total land area and the trees can grow to a height of more than 5 meters. It does not include land that is predominantly urban or used for agricultural purposes. Interestingly, land that temporarily has no trees is still considered to be a forest when the disturbance is known to be temporary and trees are expected to grow back – after harvesting, fire, or an insect infestation. After wildfire, for example, it can take a decade or more for trees to regenerate and grow back to a height of 5 meters or more. During this period, the forest continues to provide important habitat for plant and animal species that depend on young forests. Canada has 347 million hectares of forest – the majority of which are located on publicly owned land. Many are in parks or protected areas; others have been designated for multiple-use sustainable forest management; and still others are in remote, sparsely populated areas where forests are not designated officially for particular uses. To learn more about Canada’s forests and forest products industry, check out the 26th edition of The State of Canada’s Forests: Annual Report 2016. This annual snapshot from Natural Resources Canada explores the themes of sustainable forest management practices as well as climate change strategies and solutions.